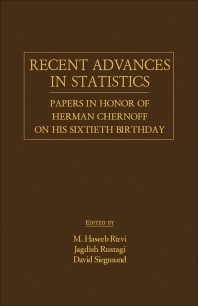 Recent Advances in Statistics: Papers in Honor of Herman Chernoff on His Sixtieth Birthday is a collection of papers on statistics in honor of Herman Chernoff on the occasion of his 60th birthday. Topics covered range from sequential analysis (including designs) to optimization (including control theory), nonparametrics (including large sample theory), and statistical graphics. Comprised of 27 chapters, this book begins with a discussion on optimal stopping of Brownian motion, followed by an analysis of sequential design of comparative clinical trials. A two-sample sequential test for shift with one sample size fixed in advance is then presented. Subsequent chapters focus on set-valued parameters and set-valued statistics; large deviations of the maximum likelihood estimate in the Markov chain case; the limiting behavior of multiple roots of the likelihood equation; and optimal uniform rate of convergence for nonparametric estimators of a density function and its derivatives. The book concludes by considering significance and confidence levels, closed regions and models, and discrete distributions. This monograph should be of interest to students, researchers, and specialists in the fields of mathematics and statistics.